Staff and students have staged a demonstration against Britain's highest-paid Vice Chancellor, despite her announcing she will step down from the role next year. The University of Bath's Vice Chancellor, Professor Dame Glynis Breakwell, earned more than £400,000 a year. 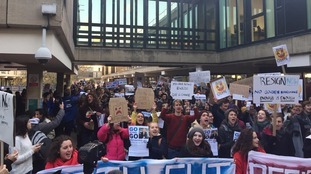 The rally was organised by the group Bath Students Against Fees and Cuts. The University funding watchdog said it was looking into a complaint made against her. In an interview with ITV News, Dame Breakwell said it would be possible for someone to do the role for £150,000 but questioned whether they would do a "really good job". I will step down as Vice-Chancellor on 31 August 2018. Until then I am still in post. By then I will have been Vice-Chancellor for 17 years, that is one third of the entire life of this university. So it's a very long time to have been Vice-Chancellor and I think it's appropriate now that I signal to the university that I will be standing down then so that the university can have an orderly transition to the next Vice-Chancellor." A university council meeting today, 30 November, follows on from the report by the Higher Education Funding Council for England (HEFCE) into senior pay and governance at the university published on 20 November. The meeting was set to take place at 4pm in the Wessex House Council Chamber. The council is the governing body of the university with responsibility for the institution's finances and the conduct of the university's affairs.